Electronic drums. For the pro drummer, it’s not a question of whether or not to play them. It’s a question of whether or not to add triggers to an acoustic kit, add a multi-pad, or ditch the acoustic kit entirely and settle in behind an electronic kit. The advantages of electronic drums are numerous over their acoustic counterparts—sound variety on-the-fly, ease of recording and live performance without elaborate mic setups, ease of transportation, silent practice capability, and more. But we understand the variety of reasons why many drummers have avoided them. Historically, electronic drums just didn’t respond like real drums (and the early units certainly didn’t sound very acoustic). Even today, in order to get a kit with a pro quality feel and hardware that doesn’t feel sourced from the toy store junk bin, you have to spend thousands of dollars to step up to the professional electronic drums level. And that price barrier has kept thousands of drummers from making the switch. If only you could get pro-level electronic drums for a reasonable price! We’re happy to say that in the case of the Alesis Strike Pro electronic drums, now, drummers can get studio- and live gig-worthy electronic drums at a price that is firmly grounded in reality. With great features, very good feel, fantastic sounds, and quality hardware, the Strike Pro is a great choice for drummers ready to make the leap, or those looking to upgrade from their entry-level electronic drum kits. 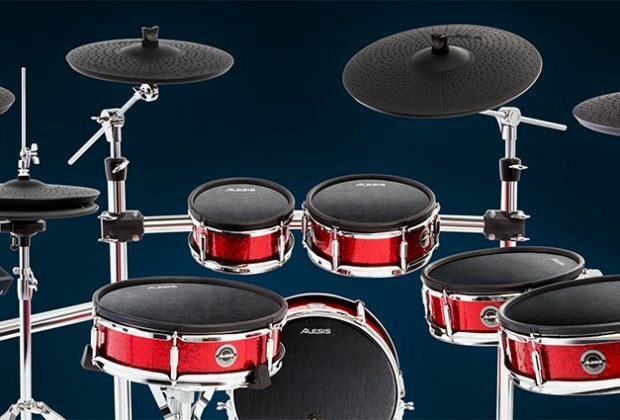 And for players who don’t need such a large kit, Alesis also offer the Strike kit, which includes the same great sounding drums in a smaller kit configuration at a lower price. The Alesis Strike Pro Kit is a complete, six-piece electronic drum kit that consists of the Strike Performance Drum Module (the brain), 14” kick drum pad, 14” dual-zone snare drum pad, 8”, 10”, 12”, and 14” dual-zone tom pads, a 16” triple-zone ride cymbal, three 14” dual-zone crash cymbals with chokes, and 12” hi-hat cymbals. The kit is especially sharp looking for the stage, with dual hoop, wooden shells wrapped in a deep red sparkle finish. 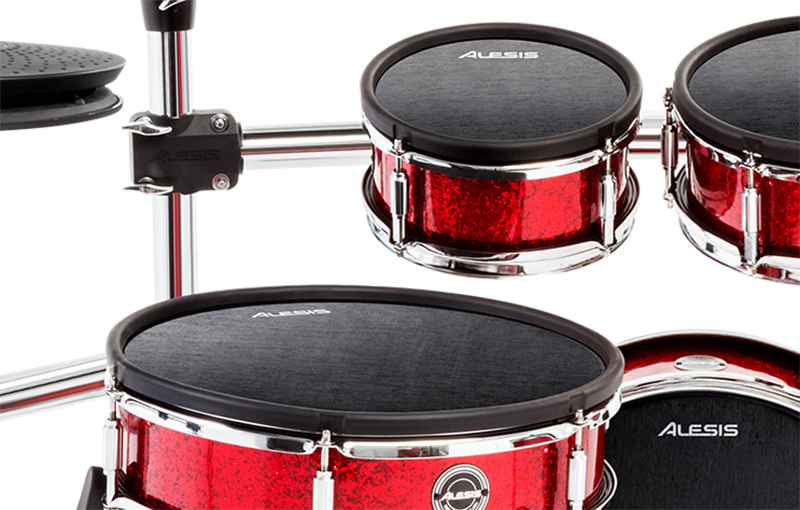 The drum pads feature mesh heads with multiple sensors, and since you’re already asking, “Are these as good as the mesh heads found on high-end V-Drums?” we will simply state that Alesis is the actual patent holder on mesh heads with multiple sensors, and not the other way around as you may have erroneously assumed. The drum heads have individually adjustable tension, and it should be noted that you must use a plastic or rubber beater on your kick drum pedal—not a felt head, as that can damage the mesh surface. Holding the kit together is a four-post chrome rack, with an extra-long boom arm on which to mount the brain. Cymbal stands have tooth lock collars and fold straight into the rack tubes for transport (or if you want to use them in a non-boom manner). We played the first-generation Strike drums previously and are happy to report that this drum rack is a significant hardware upgrade over the earlier version. Also included is a doubled-braced snare drum stand. A nice inclusion that compliments the plentiful hardware is a prewired cable snake with individually labeled jacks for neatly connecting the drums and cymbals to the brain. 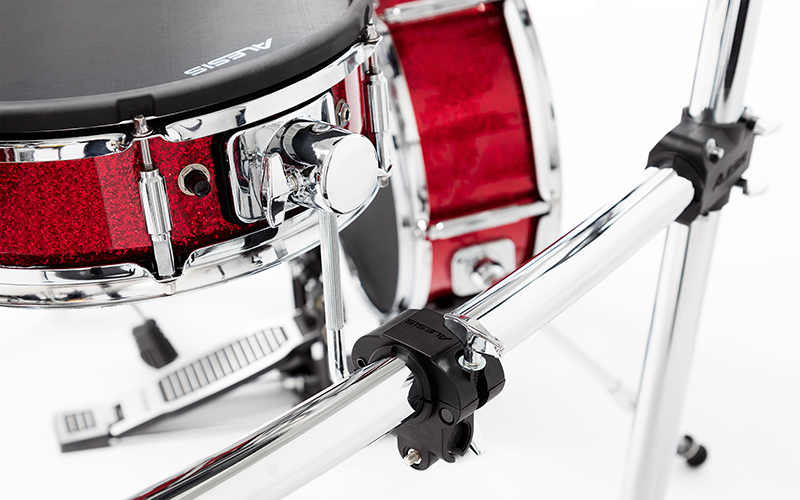 The only hardware you need to add are your favorite kick drum pedal and hi-hat stand. The Alesis Strike Performance Drum Module is truly the “brain” of it all, and this one includes 110 drum kits utilizing sounds from its library of over 1,600 multi-sampled instruments. Everything from acoustic drums to percussion to exotic sounds and effects are included. Looking at the Module itself, the top panel features no shortage of controls. A 4.3” LED colored display screen facilitates easy selection and editing of drum kits, settings, customization, preset selection, function controls, and other relevant information. The Main Volume and Aux In level knobs are located at the head of the top panel. The Module features twelve individual sliders to adjust independent drum levels within your current kit, while the Main Vol control governs the overall kit output level. Moving on to the rear panel, the module features numerous ins and outs for the individual drum triggers, and in addition to stereo output for typical stage use, there are eight direct outs for optimal studio recording, where you would like to send your various drums to separate audio tracks, and they are arranged as follows: kick, snare, hi-hat, ride cymbals, left and right toms, left and right crash cymbals. 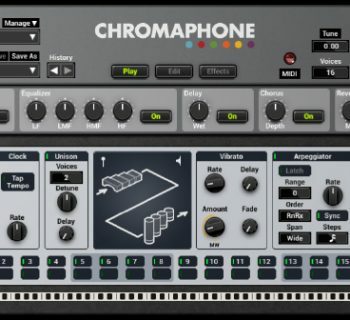 The Module includes drum kit effects such as Reverb, Compressor, EQ, Delay, and Modulation. 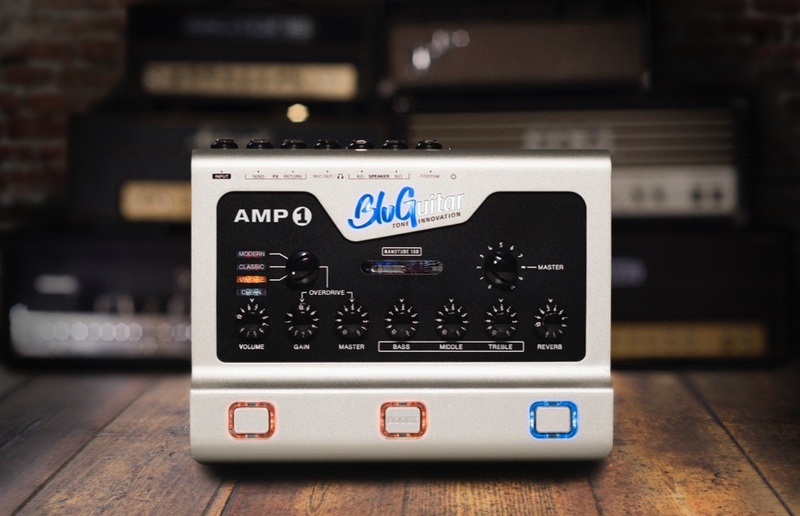 When using the individual drums outputs, though, the internal effects are bypassed, so you can monitor from your stereo output (or headphone jack) with effects, while the dry signals get recorded in the studio. The Module has standard MIDI connectivity over DIN-5 cables as well as USB MIDI, which is also used for connectivity to a software editor that runs on MacOS and Windows for large-screen drum kit editing. 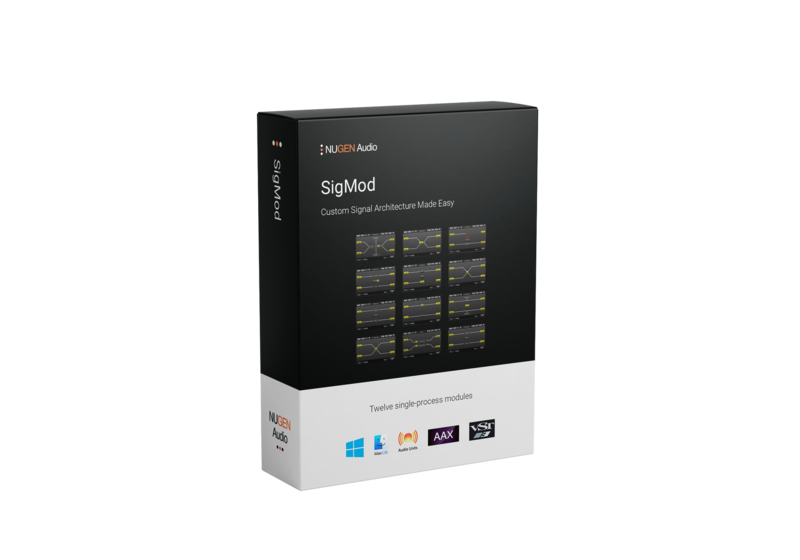 The Module has sampling capabilities, as well as the ability to load external samples, and there is an SD card slot (8GB SDHC card included) to which you can save your custom drum kits and sample content. The Aux In 1/8” connecter is an additional input for connecting devices like a smartphone, laptop, or other music playing device to use as sampling material or to simply play along. Playing the Alesis Strike Pro kit couldn’t be any easier. It only took us around 30-45 minutes to assemble the rack and the kit, and we had no trouble utilizing our DW 5000-series double-kick pedal (the kick drum pad accommodates dual beaters). We appreciated that the kit included a ton of Velcro tie-wraps to secure the cables to the rack, and when it was time to take the kit to a gig, we simply removed the toms and the brain, folded up the cymbal arms, and then collapsed the rack in on itself while leaving the cables attached to the rack itself for easy setup. The Module was very straightforward in its operation, and it was easy to select kits and modify them with the replacement of various sounds. 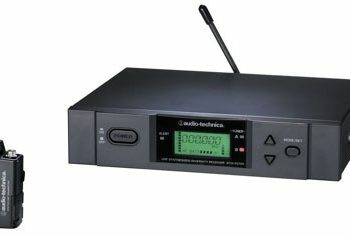 It offers a click track, and you can record songs or backing tracks into the sampler (limited only by available storage space on the SDHC card). However, there is no onboard sequencer, so if you wanted to add percussion to a song, you would have to play it into the sampler or load backing tracks, both of which consume far more storage space than sequencer data. On the flip side, however, this could be an easier way to go for less technical drummers who don’t want to be bothered learning about sequencing and tracks and things of that nature. The mesh heads felt very good to play with our 2B sticks, and were sensitive enough to capture a wide range of dynamics in our playing. Although mesh heads do not feel quite like actual drum heads, drummers tend to enjoy playing on them because the stick response is similar to the bounce you get off of traditional drum heads. By default, the Strike Pro heads ship with a fairly high tension, but a few turns of the drum key can loosen them up if desired (we liked them at the default tension). The large 14” snare drum was a real treat. Part of what makes playing this kit satisfying is that the drums are of sufficiently large diameter. Combined with the wooden shells, you feel like you’re seated behind a “real” drum kit. But when it’s time to gig and you pack up the kit, you realize, wow. These don’t weigh much at all! Cymbals are probably the biggest sore spot for most drummers when it comes to electronic drum kits because plastic and rubber definitely lack the feel of real metal, and our results with the Strike Pro cymbals were a mixed bag (at first—we'll explain in a moment). We liked the crash and ride cymbals, and thought that their soft feel was better than many electronic cymbal pads we have played in the past. Multiple zones on the ride facilitated a wide variety of play style, and the crash cymbals have a region across the edge facing the drummer that responded well to cymbal chokes. Although they don’t feel like metal cymbals, the cymbal pads were quite comfortable to play, non fatiguing, and generated much less wear-and-tear on our sticks than traditional bronze. Generally speaking, if you play nothing but a fully electronic kit like this, your days of littering the floor with wood shavings may become a thing of the past. 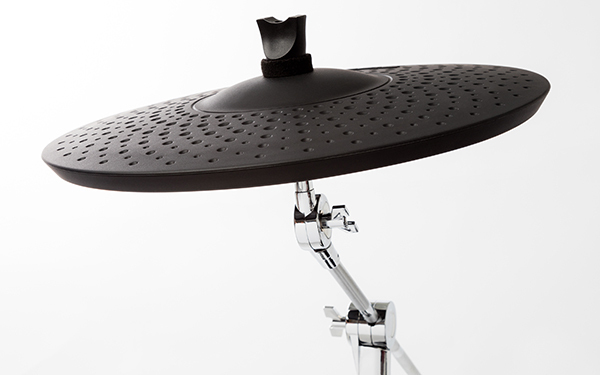 We initially found the hi-hat response to be more challenging to dial in properly. It was fine for basic pop/rock styles, but (initially) suffered some latency and lack of dynamics when playing complex patterns. There were settings to fine tune the response of the hi-hat, but even after watching and reading a support video and article, we still found ourselves disappointed by the response... until we learned about a critical hardware update, which resolved our performance issues. Tip: If you have one of the early production kits, look at the spring that rests between the top and bottom hi-hats. If it is black (as ours was), Alesis replaced this spring with a tougher/stiffer one (in chrome, for easy distinction) that responded well to all manner of play. Contact Alesis and they will mail you the replacement spring free of charge. If you're still not in love with electronic cymbals, or you just need more, you could do what we did next—build a hybrid kit. We added a real acoustic hi-hat to our kit, along with a few of our favorite bronze cymbals, for a more expansive drumming experience. Of particular note, we were able to mount some cymbals on the boom arms built into the Alesis rack and used them successfully. That may seem obvious, but on some previously tested kits with manufacturer-supplied racks, the boom arms didn't isolate vibrations well enough, and striking metal cymbals generated vibrations (cross-talk) that inadvertently triggered toms that were attached to the rack closest to the cymbal boom arms. Well done here. The Strike Editor software ran without issue on both Mac and Windows laptops of ours, but we found the user interface to be somewhat awkward because it doesn’t provide real-time, bidirectional communication with the Module. Instead, it’s more of a remote editor in which you can set up and build kits, but you then have to transfer your creations into the user memory of the Module. Fortunately, operation of the Strike Pro kit is so straightforward that building your kits directly on the brain itself is easy enough to never even bother with the software editor. 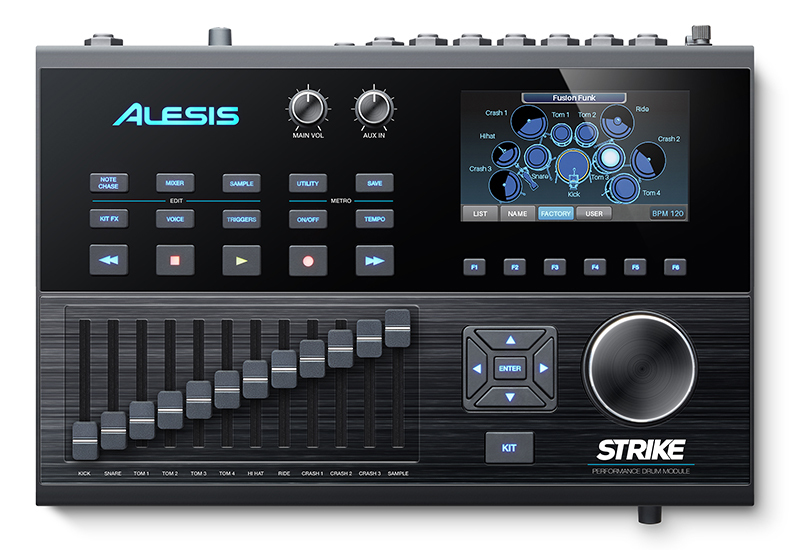 The Alesis Strike Pro kit sounds fantastic! We had a blast with this kit, and the variety of acoustic and electronic drum sounds made for more sonic possibilities than we could ever experience with a traditional drum kit. From the very first rock kit, we were impressed with the quality of the sampled acoustic drums and effects. One of the great pleasures of playing today’s best electronic drum products is that everything sounds like a nicely recorded kit in the studio. There are classic electronic drum sounds in the Strike Pro Module as well, so if you’re out to replicate the sound of a classic ‘80s drum machine, you can do that here as well. We prefered the modern electronic sounds, though, and exotic percussive sounds and effects. The sounds inspired creative drum play during which we often found ourselves lost “in the zone” as time passed away too quickly. And that’s the best thing we can ask of any instrument—that it inspires us to play and create. Working in the studio, drum sounds will never sound tired or dated, because you’re not limited to the sounds inside of the Strike Pro Module. With full MIDI capabilities, we were able to use the Strike Pro kit to alternately trigger virtual drums sounds in our DAW loaded up within popular virtual instruments including Steven Slate Drums and Superior Drummer. Alesis provides adequate setup and quick-start documentation in the boxes, but there is a wealth of additional—and essential—video and written content on their website. Be sure to watch the video on kit setup and trigger settings first, but note that one challenge we faced was that the video did not provide adequate information regarding hi-hat optimization. The video was shot using an older version of firmware, and apparently, the engineers re-thought the user interface in this area and made some significant changes. There is a lengthy help document on the website to provide further assistance with this optimization (the rest of the kit required almost no help). The video explaining how to use the sampling feature was especially helpful, too. 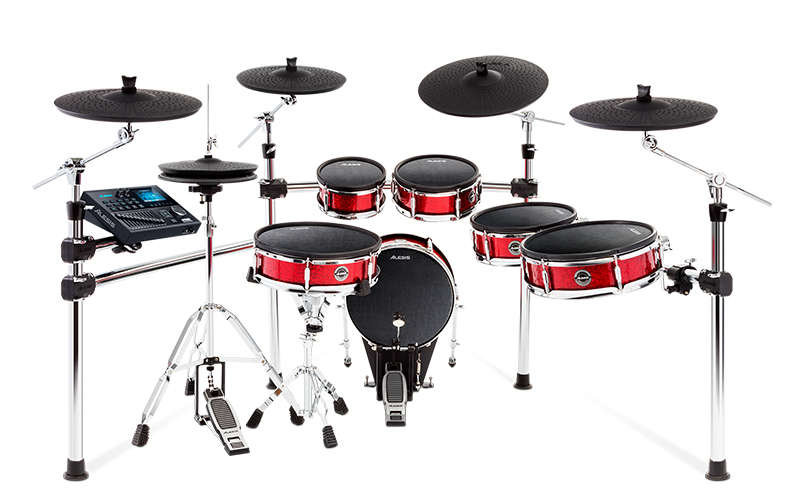 The Alesis Strike Pro kit (MSRP $3,499) sells for approximately $2,300. This is a very good price for a six-piece electronic kit with full mesh heads and five cymbals (including the hi-hats). If you don’t need such a large kit, the Alesis Strike kit has five pieces, three cymbals in total, and a smaller rack, for just $1,700 street.